Have you ever wondered how to send any type of file to someone who is no close to you online. The Good News for you is that you can now be able to send any type of file like apk,png Images, zip Files, immediately to your friends using Whatsapp. 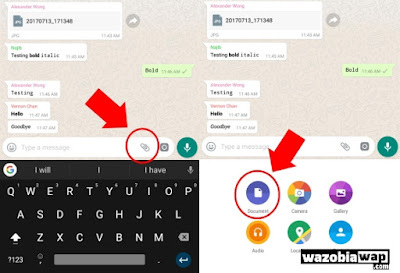 The latest version of WhatsApp for Android and iOS now allows users to send and receive any type of files, whether it’s .mp3, .avi, .php, zip files, rar files, or even APKs, any file format at all. The company last month rolled out this feature to its beta users for Android, and now after being tested successfully, the feature is being released to all WhatsApp users in the latest public update for iOS and Android. 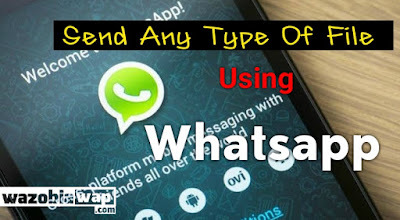 You can also send any type of files using the WhatsApp-Web client. Additionally, the latest update of the app will allow you to select photos and videos straight from the camera screen. WhatsApp is continuously updating its app to provide an exceptional experience to its over one billion users while keeping security in mind.